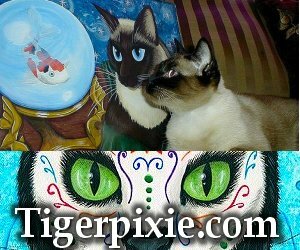 You can read a little about me, Carrie Hawks, fantasy cat artist and owner of Tigerpixie Art Studio by clicking here, About The Artist. Thank you so much for your interest in my artwork. I am currently seeking professional companies to license my artwork for many product categories. For more information please click here, Licensing. Subscribe to be the first to know about my newest artworks, products, upcoming appearances, sales, unique special offers only for members and lots more about my whimsical fantasy cats! I Invite You to Join Me on Patreon! What is Patreon? It's a form of crowdfunding similar to Kickstarter but I think it's so much better for artists like me. How does it work? I've created different Reward Tiers that you can Pledge to be a patron of with each level having it's own perks & benefits. The Reward Tiers start at just $1 a month for the "Sweet Kitten" and go all the way up to the largest tier I've named "The Fat Cat". My Patreon page will be a place for me to interact and connect with those who want to know more about me and my art. I will be sharing with you a more personal look at myself, my creative processes and inspirations than I currently do on any other social site. Depending on what Patreon Reward Tier you pledge to you will have the opportunity to see exclusive peeks of what goes on behind the scenes in my career (Patreon Only Posts, Works In Progress & New Art will be posted here first, & lots more. ), receive unique perks in the form of discounts to my website (Digitally Downloadable Coloring Pages, Your Own 25% Off Code to Tigerpixie.com & Special First Dibs List for New Art! ), special items just for you, (Monthly Original Artwork, Sketches, Prints & Gift Sets mailed right to your door) Random Patron Surprises! I send out random Patron Surprises usually one a month. Enamel Pins! Every Patron of mine "Sweet Kitten" $1 Reward Tier and Above will have an opportunity for a set amount of time to purchase my Exclusive Pins as they are released and All Patrons of mine that are in a Reward Tier where they receive a package from me each month will automatically receive my Exclusive Pins as they are released! Some Reward Tiers, like the ones with Monthly Original Art do have a cap on the number of patrons that can pledge to them so don't miss out on them. You may not use my artwork for any for-profit venture without a mutually signed contract and an agreed upon royalty payment schedule. All of my artwork has been copyrighted by me and any unauthorized use of my work will not be tolerated. Please contact me if you are interested in using my artwork in your for-profit venture at, questions@tigerpixie.com. Q- Can I use your artwork for webgraphics, signature graphics, tubes, journal icons, stationary, ecards, etc.? Q- Can I use one of your images for a tattoo? A- Yes! I'm very flattered that you like my artwork enough to get a tattoo of it! I would love to have a photo of your tattoo, once completed and healed. Please either mail to me a photo, or send me a jpg file through e-mail. I'd like to add a section on my site of my artwork made into tattoos once I get a few to display. I do not allow tattoo artists to offer my images for sale as part of their flash. Q- I've seen illegal use or unauthorized copies of your artwork and suspect copyright infringement. What should I do? A- Please Contact me and I'll have it looked into. Thank you for watching out for me and my artwork. copyright 2002-2016 Carrie Hawks, Tigerpixie Art Studio. Confirmed by the AlphaSSL Certificate Seal below, All information and sensitive data such as credit card details and personal information sent through this website are secure, private and tamper-proof. The payment methods that I accept are MasterCard, Visa, Amex, Discover through Square and PayPal Express Checkout. Your credit card will be billed upon placement of your order. Please provide accurate information as this can delay processing of your order. I also accept Money Orders in US Funds Only. Florida residents 7.5% sales tax will be added to the total before shipping costs . Items are typically shipped out within one week of order. All orders are shipped with your chosen shipping method. First Class Mail and Priority Mail are available for orders in the USA. International orders are shipped First Class International. I may need to contact you if your order is flagged by my payment processing system, especially for international orders, so please make you provide correct contact information. I want to give you the best service possible and be sure that you are completely happy with your purchase. If for any reason there is an issue with the item when it arrives, please contact me ASAP to address it. If you are not completely satisfied with your purchase, you may return the item within 15 days, for a full refund or store credit of the purchase price less S/H fees only for unopened and undamaged merchandise. If the reason for the return is due to my error you will not be responsible for the return shipping cost for any exchange. In the rare case that the product you have ordered is out-of-stock this will delay fulfilling your order. I will keep you informed of any products that you have ordered that are out-of-stock and unavailable for immediate shipment. You may cancel your order at any time prior to shipping. Applicable laws (choice of venue and forum)—Use of this website shall in all respects be governed by the laws of the state of Florida, U.S., regardless of the laws that might be applicable under principles of conflicts of law. The parties agree that the Florida courts located in Escambia County, Florida, shall have exclusive jurisdiction over all controversies arising under this agreement and agree that venue is proper in those courts. Please look through the Info/FAQ before sending your message, your inquiry may already be answered there. If not please Contact me and submit your question. I will reply to your e-mail as soon as possible.